Helena Lundback and Bukowskis Erblumme got a late call-up but provided a vital first-round clear to help Sweden to victory in the fifth leg of the 2010 Meydan FEI Nations Cup at Falsterbo, Sweden today. Photo: Lotta Gyllensten. Falsterbo (SWE), 9 July 2010 – On an afternoon of dramatically fluctuating fortunes, the host nation of Sweden sprung a big surprise as they swept to victory in the fifth leg of the 2010 Meydan FEI Nations Cup on their home ground at Falsterbo today. It was against all the odds, because they had previously picked up only two points in the series and seemed to be staring relegation in the face at the end of the season. But in typically stubborn style they didn’t let the pressure overwhelm them, and three first-round clears ensured they would always be in contention while it was their Olympic silver medallist, Rolf-Goran Bengtsson, who clinched it for them in the end. The Netherlands finished a strong second, also shaking off some distressingly poor results in previous legs of this super-tough Meydan FEI season, while Spain and France divided third, Ireland and the USA shared fifth place and Great Britain had to settle for seventh this time out. Switzerland finished eighth after only just managing to squeeze into the second round and, in another real turn-up for the books, the German team were sidelined at the end of round one along with the unfortunate Polish side that suffered elimination. The strong field of competitors will include rider Kelley Farmer. Bristol, WI – July 9, 2010 – The first ever Tapestry Farm Derby Day promises a day of hospitality and exciting competition at Tapestry Farm in Bristol, Wisconsin. On July 11th, the 120 acre facility one hour north of Chicago will host a $25,000 USHJA International Hunter Derby, a $5,000 USHJA 3′ Derby, and a $10,000 Junior/Amateur Owner Speed Derby. A strong field of competitors is expected including Pony Lane Farm’s Bella Blue, shown by Maggie Jayne, and Nancy Amling’s Taken, shown by Kelley Farmer. All classes will utilize the farm’s outside course on grass with its natural obstacles and featuring a beautiful, brand new bank. Spectators will have the opportunity to provide support for the worthy USHJAF’s Horseman’s Assistance Fund and at the same time enjoy the highest level of hospitality by buying a ringside table. Held in conduction with the Showplace Summertime Horse Show at Ledges, Derby Day will provide the finale to a great horse show, providing a field trip for participants and offering all a “day in the country”. Derby Day was first envisioned by Tapestry Farm’s owner Donna Struve. 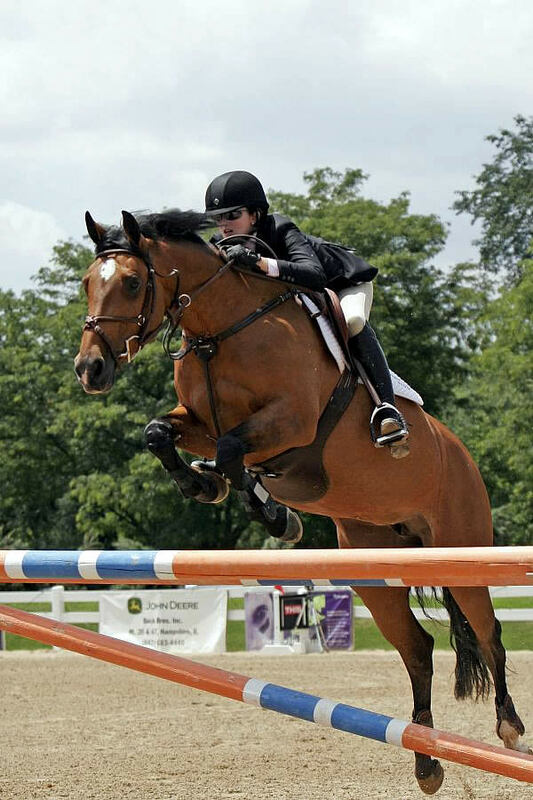 Watching the growing popularity of the hunter derby format, she pictured her farm as the perfect venue to host a showcase event, giving Midwest riders the opportunity to compete close to home in an international caliber event while hosting a summer outing and raising money for charity. FALSTERBO, Sweden, July 9 — Germany’s Jonny Hilberath who has been competing Amüsant internationally for just four months notched their first victory Saturday by winning the inaugural €30,000 (US$37,860) Moorland Grand Prix Special Dressage Derby presented by Agria as part of the Exquis World Dressage Masters. 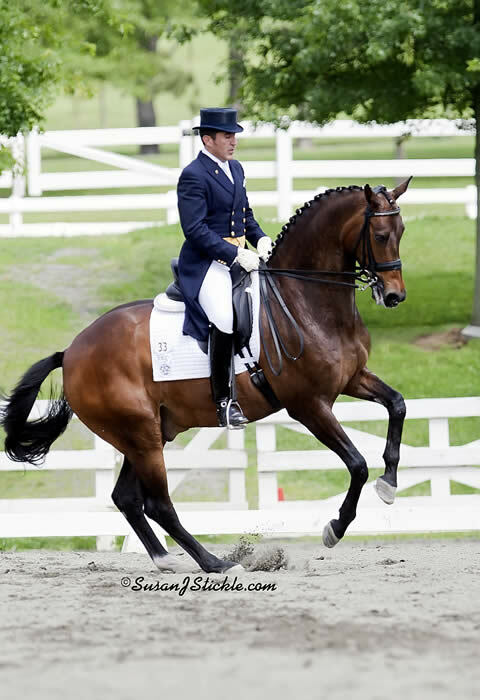 Jonny and the 12-year-old Oldenburg gelding owned by Elisabeth Max-Theurer and competed once internationally by her daughter, Victoria, almost two years ago scored 69.292 per cent despite mistakes in both the one- and two-tempi changes. The Netherlands’ Christa Laarakkers and Divoza Horseworld Ovation finished second with 67.250 per cent and hometown favorite Charlotte Haid Bondergaard on Lydianus was third on 66.292 per cent. For Jonny and Amüsant’s first WDM, and the first time the Falsterbo Horse Show has included the prestigious CDI5* in its competition schedule the win earned them €9,500 (US$12,000) while Christa, who competed at WDM in Palm Beach earlier this year, earned €7,000 (US$8,830) and Charlotte €5,500 (US$6,940). 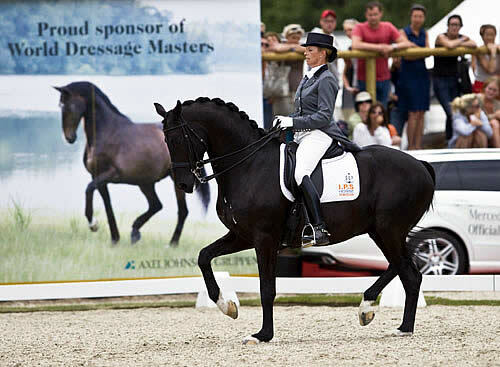 FALSTERBO, Sweden, July 8 — Anky van Grunsven, the most successful rider in the Exquis World Dressage Masters, on Thursday rode a newly recovered IPS Painted Black to victory in the Grand Prix of the first €100,000 CDI5* competitions staged by the Falsterbo Horse Show. Tinne Vilhelmson Silfven, one of Sweden’s most popular dressage stars, gave the big crowd that turned out to support the event good cause to applaud even more enthusiastically than they did for all the riders when she and the 11-year-old Favourit turned in a performance that placed them second. Anky and the 13-year-old stallion Painted Black was the unanimous choice by the judges for first place in the Nurnberger Versicherungsgruppe Grand Prix presented by Agria with a score of 75.234 per cent with Tinne and Favourit posting marks of 71.957 per cent. Germany’s Anja Plönzke and Le Mont d’Or, competing in their fourth WDM CDI5* event so far this year–Palm Beach in the USA, Munich, Germany and Cannes, France in addition to Falsterbo–was third on 68.723 per cent. 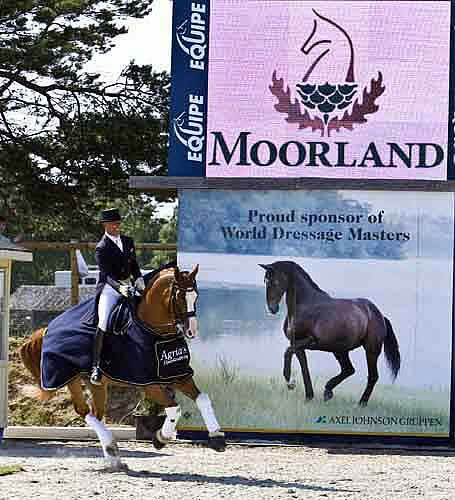 FALSTERBO, Sweden, July 7 — The Exquis World Dressage Masters, established on both sides of the Atlantic in its second year as the world’s richest lineup of dressage shows, starts its first €100,000 (US$126,000) CDI5* at the famous Falsterbo Horse Show Thursday with riders from six nations scheduled to perform in the Grand Prix. Anky van Grunsven, the winningest competitor in the World Dressage Masters since the inaugural test event at Cannes two years ago, on IPS Painted Black will lead a squad of three combinations from The Netherlands in seeking to add a fifth title to the two she won at Palm Beach and two at Cannes. A strong Swedish squad of the four most likely combinations to represent the nation at this year’s World Equestrian Games in Kentucky, German Olympian Ulla Salzgeber on Wakana and Anja Plönzke on Le Mont d’Or as well as the USA’s Catherine Haddad on her increasingly successful Winyamaro, Evi Strasser of Canada on Quantum Tyme and the top two riders from Poland are scheduled to start in the €10,000 Nürnberger Versicherungdgrupper Grand Prix presented by Agria. 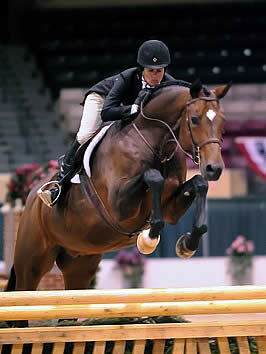 Showman and Sandy Ferrell won last year's Future Hunter World Championship at the Capital Challenge Horse Show. Photo © Jennifer Wood Media, Inc.
Upper Marlboro, MD – July 7, 2010 – The Capital Challenge Horse Show, now in its 17th year of competition, strives every year to provide the best possible horse show for its exhibitors. This includes adding new classes that offer special opportunities for every level of rider. This year’s show will once again start with the Capital Challenge Equitation Weekend, presented by Bigeq.com, on October 2-3, and the horse show will continue on October 4-10. Highlights of the Capital Challenge Horse Show will include the North American Equitation Championship (Oct. 3), the Taylor Harris Insurance Services (THIS) National Children’s Medal Finals (Oct. 3), the World Champion Hunter Rider (WCHR) Emerging Pro Challenge (Oct. 6), the North American Junior/Amateur-Owner Jumper Challenge Cup (two rounds held on Oct. 8-9), the ARIAT National Adult Medal Finals (Oct. 8), and the WCHR Professional Finals (Oct. 8). Maggie Jayne and Caretina III. Photos © 2010 Lauren Fisher/PMG. Wayne, IL – July 6, 2010 – Following a very successful three weeks of competition at the 2010 Showplace Spring Spectacular Horse Show, many of the Midwest’s best riders are currently sitting at the top of the standings for the coveted $60,000 Showplace Leading Rider Series. Returning for its fourth consecutive year, the Leading Rider Series has made an exciting addition to its lineup this year, adding six divisions of leading hunter awards along with the previous jumper honors. 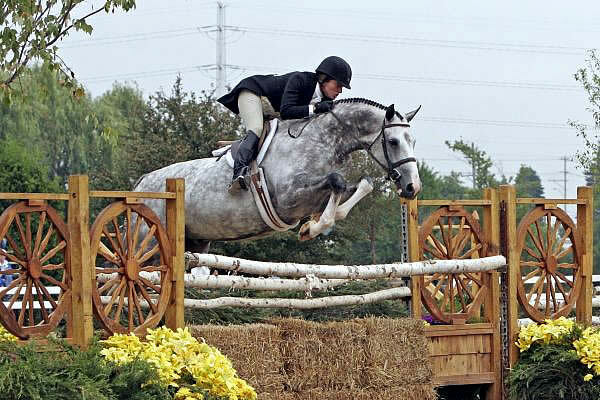 The 2010 Leading Rider Series will offer $32,500 in jumper money and $27,500 in hunter money. The Showplace Leading Rider Series tracks riders through a series of nine events throughout the season and awards prizes to the top three riders in each category. Riders in the series are ranked according to the prize money won by their top placed horse in the Classic or Grand Prix for their division. The finale for the Showplace Leading Rider Series is at the Showplace Fall Classic Championship Horse Show on September 14-19, 2010. There, the top three riders in each section will win bonus money (first place- 50%, second place- 30%, and third place- 20%), and the top ten will receive awards. Falsterbo (SWE), 6 July 2010 – The defending champions from France still hold the whip hand as the 2010 Meydan FEI Nations Cup series moves to Falsterbo in Sweden this Friday. Full of flair and confidence they blazed a trail through the first-half of the season with a spectacular hat-trick of wins, and they hold an eight-point lead over Great Britain in second place going into the last four rounds of the eight-leg series. After a superb victory from the all-girl team in Rotterdam three weeks ago the USA has improved to third with just 3.5 points separating them from the British, while Germany lies fourth, just 0.5 points further adrift. The Spanish team, newcomers to this top level of team jumping, have shown themselves more than equal to the task and in fifth place hold a single-point advantage over the Irish in sixth. But neither of these nations can afford to rest on their laurels. 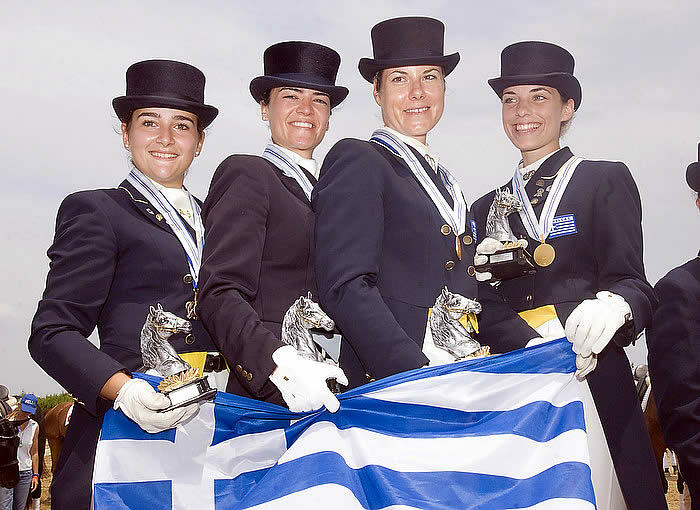 Pictured after winning team gold at the 2010 FEI Balkan Dressage Championships in Katerini, Greece are the Greek team of (left to right) Kelly Sklavounos, Katerina Los, Eleni Myrat and Hara Pouli. Photo: Alexis Vassilopoulos. 5 July 2010 – Greek riders claimed a colossal medal-haul at the 2010 FEI Balkan Dressage Championships in Katerini, Greece over the weekend including three sets of team gold and two individual titles. However yesterday (Sunday) it was Romania’s Sorin Alexandrescou who was crowned Senior Individual champion with a great performance from Mercur Casino as his Greek opponents had to settle for silver and bronze. The Balkan Championships, which first took place in Istanbul, Turkey in 1968, have embraced a varying number of disciplines down the years and Dressage first featured in 1992. 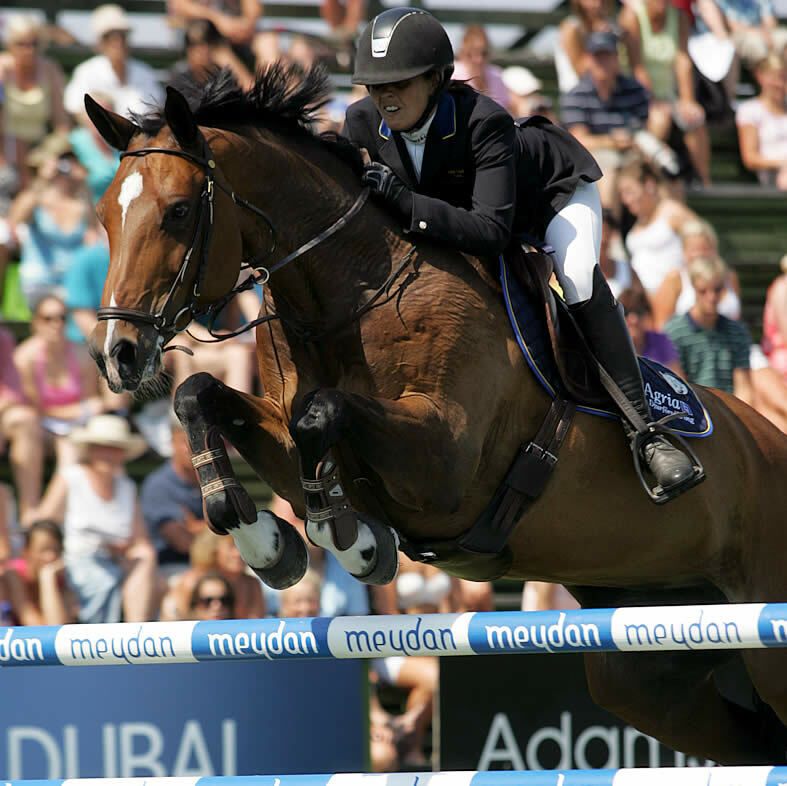 The region covers Croatia, Bosnia and Herzegovina, Serbia, Montenegro, Macedonia, Romania, Bulgaria, Greece, Cyprus, Turkey and Moldovia, and, from the outset, the Championships have succeeded in promoting and improving the standard of equestrian sport in south-east Europe. 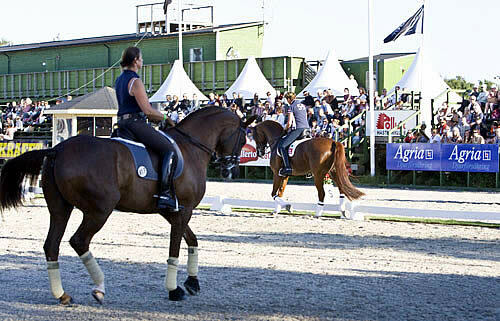 This year the Jumping and Dressage disciplines have been scheduled for separate locations and from 2 to 4 July, the Pieria Riding Club in Katerini, which hosted the Balkan Jumping Championships in September 2009, opened its gates once again for the 2010 Dressage equivalent. Whitehouse Station, NJ (July 5, 2010) – International dressage rider Dr. Cesar Parra and Olympia, the 13-year-old KWPN gelding owned Dr. Lori Washton, are currently ranked number one for the FEI small tour heading into the 2010 Collecting Gaits Farm/USEF National I-1 Dressage Championships. Parra has been riding Olympia for over a year and recently returned from a very successful winter season in Florida. Parra and Olympia returned to New Jersey and made their debut at the ESDCTA Memorial Day Show. The pair won the Prix St. Georges with a score of 71.789 and also the Intermediaire I with a score of 71.000 percent. In total, this pair has shown at this level just over a dozen times and has consistently scored over 70%. Parra started showing Olympia a year ago at the Centerline Events Westbrook Hunt Club show and won the Prix St George with 75%. Last year the pair won 8 out 9 CDI classes and Parra won the coveted High Score FEI Rider Award at Dressage at Devon aboard Olympia. This year, at the New Jersey Horse Park CDI on Memorial Day they continued their victory streak winning both classes. “Olympia has developed into such an ideal horse to show. He is always trying his best,” said Parra.